This significant new line links up sections of Gravity Bong and Teddy Bears Picnic with lots of new terrain, creating the easiest free route that breaches the impressive Prow Wall. Climbing into the elevator shaft on pitch 3. Approach via Apron to Kashmir Wall. Walk and Scramble 15 minutes up the South Gulley to the base. The first pitch isn’t visible until your underneath it. 5.10d. 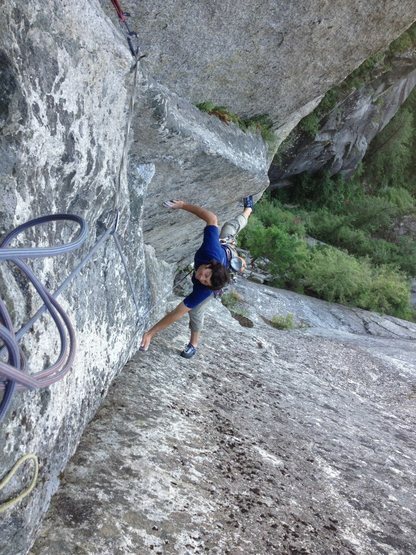 An awkward flare leads to face traverse and right leaning crack. At the top go up and right to a bolted belay shared with Teddy Bears Picnic and Gravity Bong. 35m, watch for loose rocks on ledge. 5.10c Walk the ledge at the base of the wall left for 10m or so until you get to a 5.8 ramp with a corner crack that is a little dirty. Go up this for 15m to a stance and then get in the flake crack on the main wall until the nice ledge with a 2 bolt anchor (p. 1 of Teddy Bears joins here.) 35m. Same as Teddy Bears p2. 2 bolts on the tips flake/crack and some more cranking bring you to a ledge with a short wide crack. Up this to stance, clip a bolt, and layback the arete on the left to come to a stance at the base of the amazing elevator shaft. Stem, double cracks, jam layback up the amazing shaft to a nice ledge and 2 bolt anchor. 40m. 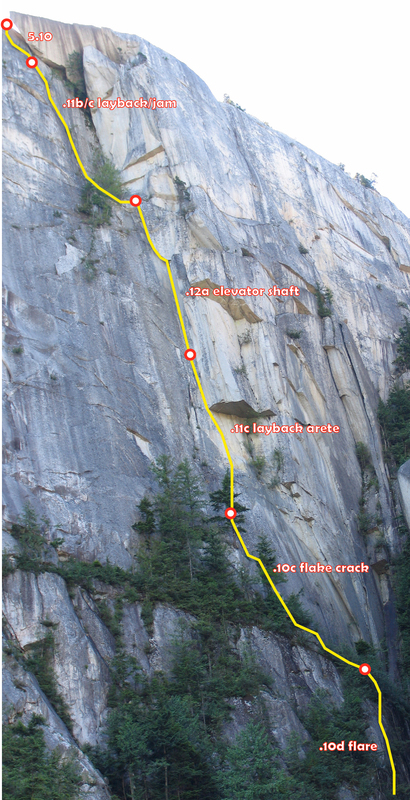 5.12a Starts the same as Teddy Bears but goes up and left through the slot at the top of the shaft. 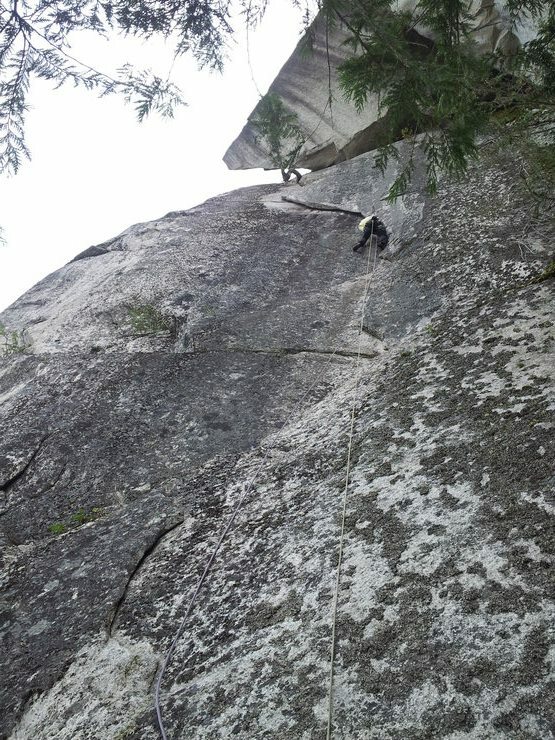 Tips laybacking and stemming in the brilliant rock gets you to a chimney stem rest. Bust up and left in the purple camalots out the roof that goes at an easier grade than you would imagine. Follow the feature up and left until you get to the treed ledge with with a 2 bolt anchor. 40m. 5.11, the Gentleman’s Flake, harder for small hands. At the left end of the ledge followed the flake cracks up to the stumps in the overlap flake crack, that can be jammed, laybacked or underclinged, 1 4 camalot at the start of the business and then 3 camalots out the traverse. Pull on the tree to the 2 bolt anchor. 40m. 5.10 Lots of options, the crux is in the first ten feet. then you can either grovel up the chimney with face holds to a 2 bolt anchor (15m) or traverse left past a chopped cedar stump and face climb on cracks and ledges far left to another 2 bolt anchor by a small tree. Pull over to an awesome top out ledge! The Gentleman’s Flake. Pitch 5. 1 x .4 to 4, with doubles of .5, .75 and 3. C3s x 2 (yellow, red and green) with one purple. 5 quick draws, 5 shoulder slings. Walk off towards the first summit across the top of the prow wall to gain the 2nd summit trail above the ladder.